When a person is accepted into studies, he/she signs and returns the Home Temple Code of Ethics. The new Postulant for Ordination receives study materials including a certificate to operate as a Subdeacon of the Home Temple authorizing use of Pre-Consecrated Elements for private operation and practice of the Sacred Eucharist as a "Deacon's Mass," an ancient tradition recorded in the Book of the Acts and practiced from the time of the first-century churches at Rome. When the Candidate is Ordained to the Diaconate, he/she continues to operate with Pre-Consecrated Hosts (only an Apostolic Priest/ess can Consecrate Hosts), but is now authorized to offer the Eucharistic Mass publicly. When finally the Candidate is Ordained to the Priesthood, he/she is fully empowered for independent sacramental ministry (see PROGRAM). 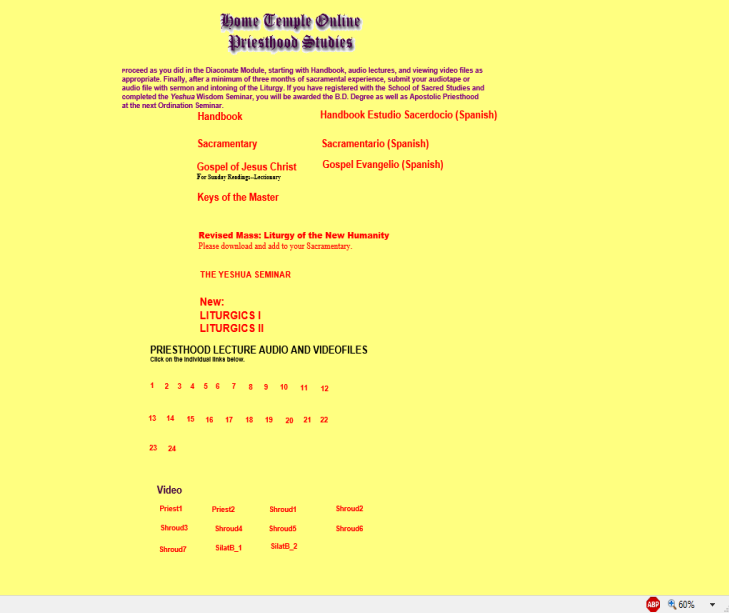 Those who have already received independent Apostolic Ordination or a denominational seminary education will be received as Home Templar Ordinands upon reception of appropriate letters of reference and Letters Dimissory from the previous Bishop (if possible), and upon completion of a special course of studies (FAST TRACK--SEE PROGRAM) designed to make up deficiencies in previous education. 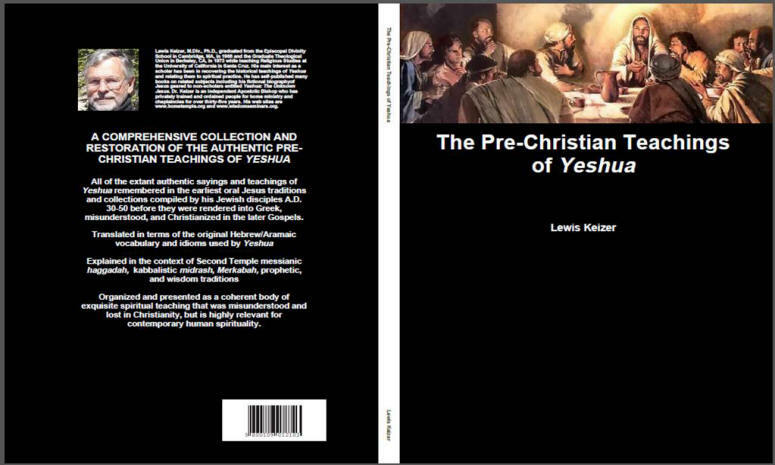 Jesus Studies: Teachings, practices, and concepts of Mar Yeshua (Master Jesus) in Aramaic language and historical context; The Galilean background of Jesus; prophetic, rabbinic, and wisdom schools reflected in the Teachings of Jesus; medieval Jewish Kabbalistic and Chasidic schools transmitting the Teachings, practices, and concepts used by Jesus; Shroud of Turin studies. 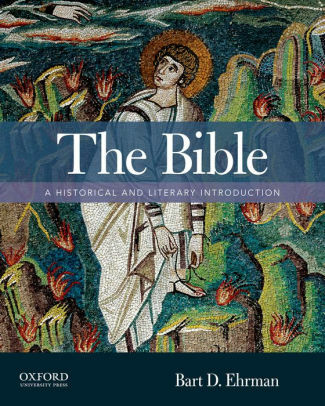 History: Origins and Development of Ancient Hebrew Religion; Israel, Judah, and the Prophetic Schools; Second Temple Judaism; Origins of Rabbinic Judaism and Christianity; Medieval and Modern Jewish and Christian History; Origin and History of Women's Ordination, Independent Episcopate, and the Home Temple Movement. Scripture: Old Testament (Pentateuch, Prophets, Writings); Intertestamental Apocrypha and Pseudepigrapha; New Testament; New Testament Apocrypha and Pseudepigrapha, including Dead Sea Scrolls and Nag Hammadi Coptic Gnostic Tractates; relevant medieval and modern spiritual literature. 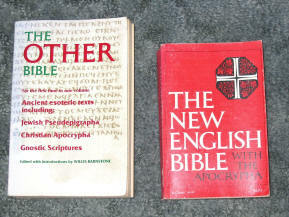 Liturgics: Comparative world shamanism and priesthood; history of Jewish and Christian liturgics; modern liturgical reform; applied liturgics; harmonic chanting and use of voice; liturgical symbolism; the Home Temple and altar; history and development of prayer; incense, fragrance, color, candles, elements, voice, and mudra in liturgy. 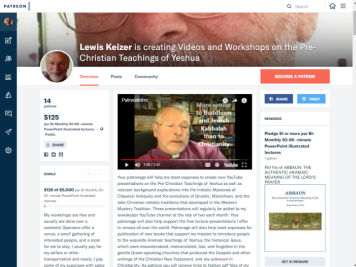 Religious Tradition and Ritual: Use of the Sacramentary and Sacraments for the EUCHARISTIC LITURGIES, which are are the Liturgy of the Chalice (Eucharist, Communion, or "Mass") and the Shabbat Seder; and LIFE-CYCLE RITUALS, which are the Wedding; Funeral; Kabbalistic mikveh, purifications, and chrismation for healing, exorcism, grief, and other life-crises or transitions; Pesach or Passover; and Pascha or Easter. Integrative Spiritual Practice: Six-Month Spiritual Journal (Diaconate); Temple meditation practice; The Vigil of Jesus; the Kabbalistic Psalm recitations of Jesus; The Master's Prayer and the prayer techniques of Jesus; introduction to Kabbalistic prayer, development of harmonic chanting technique, theurgical healing, exorcism, purity practices, and other Home Temple practices; applying the Teachings of Jesus for individual and social evolution. 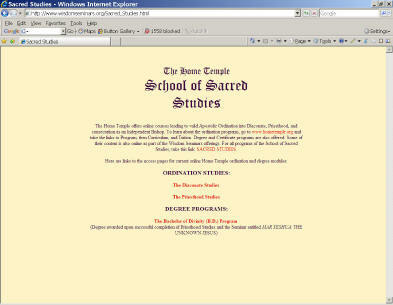 Scroll down to the SCHOOL OF SACRED STUDIES. Click. 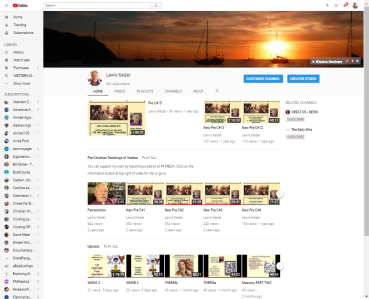 This will bring up the very simple access page for Diaconate and Priesthood Studies. 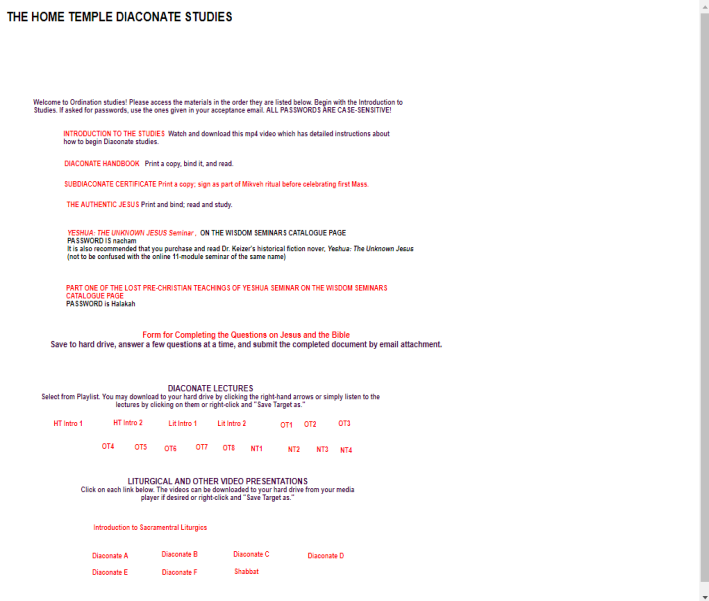 Click on The Diaconate Studies. This page is open to the public. 1. Publications of the Wisdom Seminars on topics of interest (see http://www.wisdomseminars.org/Catalogue.html). 2. Since Priests nominated by their Bishop for elevation to the Episcopate must have completed the First Order Wesak Initiation, Empowerments, and studies for T:.H:.G:. (see THG), it is strongly recommended that THG work be commenced as soon as possible after acceptance for Ordination studies, since a minimum of thirteen months, beginning at Wesak (usually May) is required for completion of First Order.